Home › Transgender, Transsexual, Trans › Preventing transgender teen suicide means working with trans kids long before they hit puberty. Preventing transgender teen suicide means working with trans kids long before they hit puberty. TransActive is a Portland, OR area non-profit focused on trans youth. THE GUERRILLA ANGEL REPORT — Staggering fact: 83% percent of teens who think their bodies don’t match their minds gender-wise consider suicide. The key to prevention according to TransActive, the only transgender youth nonprofit in the country, is reaching the kids before puberty. Jenn Burleton, Executive Director of that Portland, Oregon trans youth organization, was interviewed in The Portland Mercury this week about the options and steps for kids and their parents. This included a discussion of the “puberty blockers” option that is becoming more common. In the interview Burleton said parents sometimes can notice a potential trans child as early as 18 months and of the 83 percent of teens who consider suicide, 41 make an attempt. Portland-specific information indicated there are 3200 trans kids in the area with Portland having the largest trans population (overall youths and adults) in the United States. They are currently reaching 70 families leaving some 3100 kids possibly without much guidance. She also mentioned the three-year-old Oregon Safe Schools Act which says every child in the state can express their gender however they want. I urge those seeking help check this organization out and pass along its existence to those that would benefit from its services. Read the entire article here: Nonprofit Works With Transgender Kids—Long Before Puberty | Blogtown, PDX. Perhaps you could spare a moment to read it. 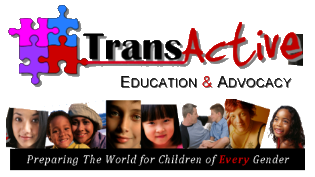 I just have a correction I want to bring up, TransActive isn’t the only transgender youth nonprofit, there’s also Trans Youth Family Allies founded by Kim Pearson. In the original article they “only nonprofit…with actual office space” and that’s how they get away with that claim because TYFA doesn’t headquarter itself anywhere, they just travel where they’re needed. Thanks for your comment Elissa! Elissa… thanks for that clarification. We don’t view it as “getting away with” anything, it’s just a simple statement of fact. There are, of course, other organizations advocating for trans children and youth, including (among others) Trans Youth Equality Foundation, Gender Spectrum, Gender Odyssey and of course, Trans Youth Family Allies. I’m particularly familiar with TYFA since, I co-founded that organization with Kim Pearson and two other mothers of trans youth. I was, in fact, the originator of the idea for the organization and the only woman of trans experience among the original four. And for the record… while TransActive is based in Portland, we have multiple members of our staff who can, and do, travel when necessary or requested. Thank you for the support you give to trans youth organizations!